Simple Things: We're going back for another bite . . . It sounds like so much fun. . . . wishing the red head great success as well. The show is Feb 15 and 16. 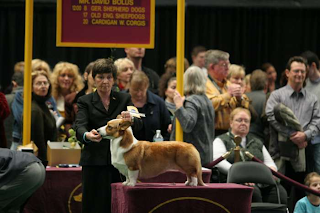 Herding dogs show on Monday. Oh please come Heidi - it is sooooo much fun and this is an event where the more the merry is the honest truth! I wish I were closer... I'd love to be there to cheer that beautiful red-head on!!!! I am looking into coming down :-) I will have young pups at home, which is why I did not enter Luther. My worry is carrying home germies to my babies. But a friend & are are discussing coming down! Will you be tehre for both Mon & Tues? My friend is a GSP person, who wants to go for Tues only. Herding dogs are Monday. We will get there either Saturday or Sunday and leave on Wednesday. Good luck for Westminster! I haven't been able to make it there but have always enjoyed the videos on the net.